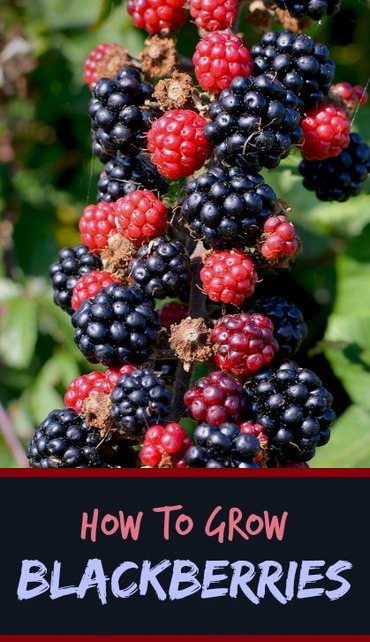 Step 1: Blackberries and hybrids are all self-fertile. Step 2: Select a site that receives full sun if possible for best berry production. Step 3: Soil needs to be fertile with good drainage. Add organic content to enrichen your soil. Step 4: Make sure you plant your blackberries far away from wild blackberries that may carry viruses. Step 5: For semi-erect cultivars, space plants 5 to 6 feet apart. Space erect cultivars 3 feet apart. Space trailing varieties 5 to 8 feet apart. Space rows about 8 feet apart. Step 6: Plant shallowly: about one inch deeper than they were grown in the nursery. Step 7: Planting may be done in late fall, however, it should be delayed until early spring in very cold areas as it could kill some hybrids. Step 8: Mulching is important throughout the season to conserve moisture and suffocate weeds. Keep a thick layer of mulch surrounding plants at all times. Step 9: Water one inch per week. Step 10: The roots may keep sending up an abundant amount of shoots (canes). Keep order by pruning away the majority of them so that the survivors can produce lots of berries. Although fresh fruit is always best, blackberries can be stored by canning, preserving or freezing.